Arnott and Vederoff Ancestors - Headstone of Louis and Maria Tunik. Lake View Cemetery, #2, N1/2 60B. On the headstone by his name are a Star of David and some words in Hebrew. 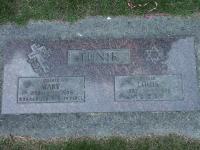 Headstone of Louis and Maria Tunik. Lake View Cemetery, #2, N1/2 60B. On the headstone by his name are a Star of David and some words in Hebrew.